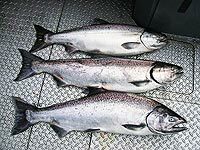 Spring Chinook also called "Springers", enter the Columbia River in strong numbers beginning in March. 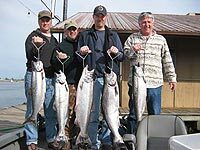 These spring salmon average 12-17 pounds and are considered by most anglers to be the crown jewel of the Columbia River's salmon runs. 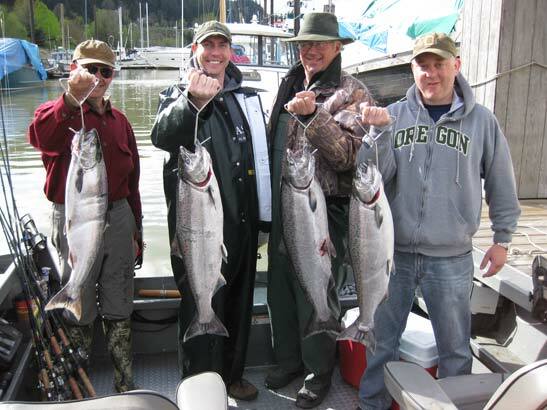 Spring Chinook salmon are highly prized for being the best eating of all salmon. 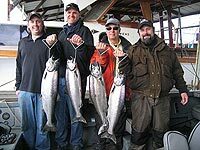 Their meat is loaded with oil and has a rich flavor. 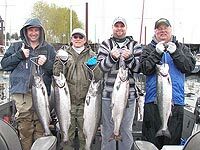 We start our season on the Columbia in March and then move over to fishing the Willamette River or Drano Lake in mid April through May. 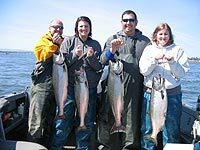 We don't anchor fish for Spring Chinook, we always troll. 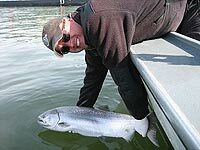 This active approach of "taking it to the fish" rather then anchoring and waiting for them to come to us, has always proven to be the most effective method for catching a lot of Springers! 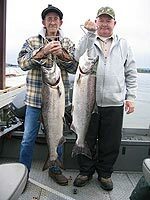 We fish on the Columbia River in the Portland/Vancouver area for these fish. 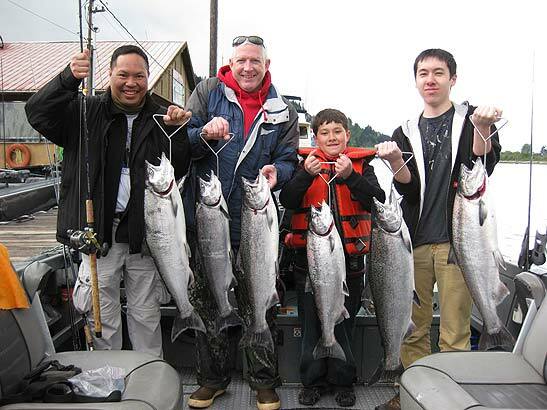 This section of river has better water clarity and is also a traditional holding area for these salmon. 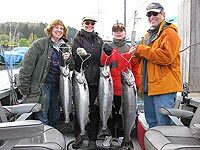 Since the salmon are holding in this area, they are willing biters! 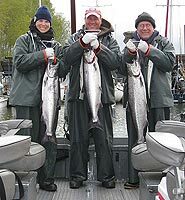 Spring Chinook fishing season in the Willamette is from mid February until July but peak season is mid April through May and this is when we target them. 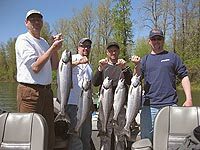 We fish the lower Willamette River in the Portland area. 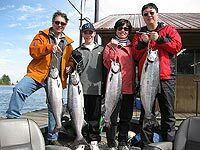 This section holds the fish until late May when the river's temperature rises to the mid 50's; it's at this point when the fish start to go over the falls to continue their upstream migration. 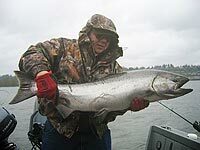 Willamette spring salmon tend to be a little larger then their Columbia River cousins. 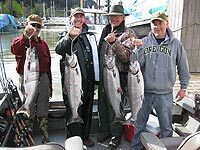 The average size for these fish is 14 to 18 pounds with fishing topping the 25 - 30 pound mark not being uncommon. 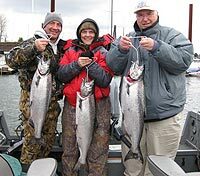 Trolling herring, prawns and spinners and utilizing some unique tricks of the trade that we have discovered, is our go-to method for putting high numbers of these salmon in the box every spring! 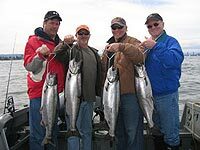 The Willamette Spring Chinook fishery is open seven days a week with a two hatchery Chinook limit. 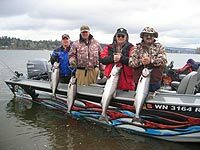 Where is Drano Lake? 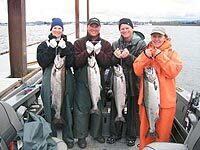 This is a very common question. 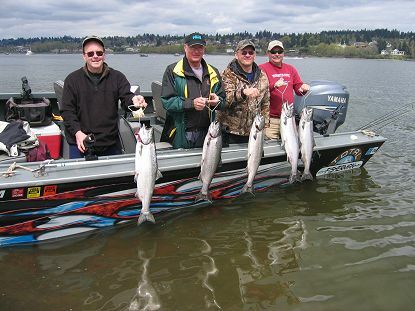 Drano Lake is located in Washington on Hwy 14 a little east of Stevenson, Washington. 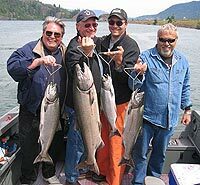 Drano Lake isn't really a lake in the conventional sense; it's actually the mouth of the Little White Salmon River. 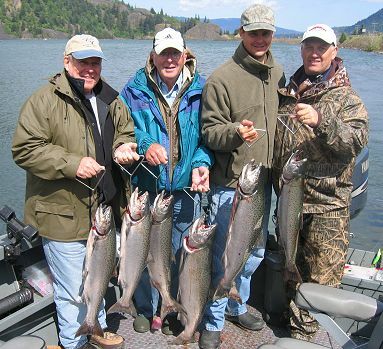 The lake is a backwater of the Columbia River that has been created by the dike that was built to support Hwy 14. 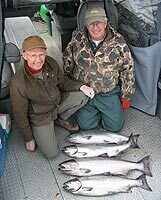 Hwy 14 separates the lake from the Columbia River, but there is an outlet for to the Columbia and this is where the salmon enter the lake.